The business of health is still very paper intensive. We researched the Top 25 US Health Systems based on full-time equivalent staffing during 2018. 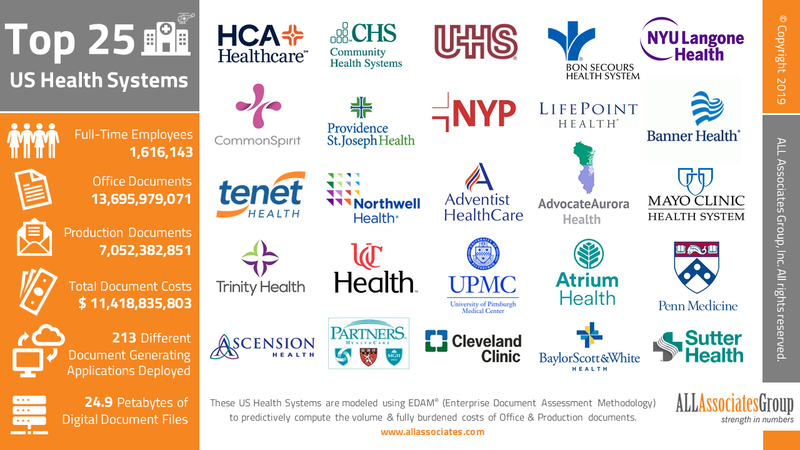 These organizations employed 1,616,143 healthcare workers which in-turn produced some 13.7 billion office and 7.05 billion production and commercial documents respectively, with a combined predicted fully burden cost just over $11.4 billion dollars. Power is something we all crave. 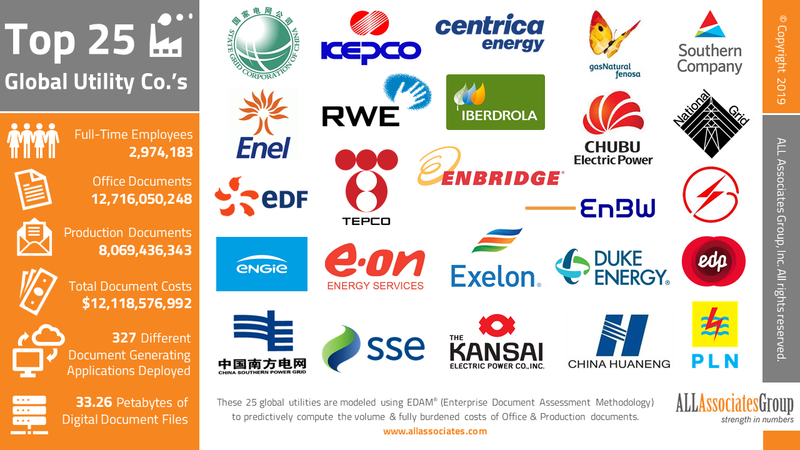 We studied 150 global Utility companies staffed by 4,458,942 full-time equivalent employees, that during 2018 produced some 19.9 billion office and 12.4 billion production documents respectively, with a combined predicted fully burden cost just over $18.8 billion dollars. Commerce is the engine that propels the world economy. 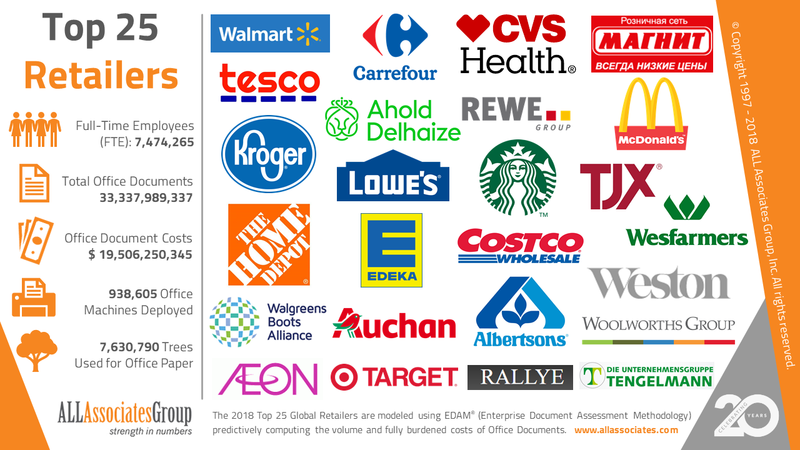 We studied 243 global retail companies staffed by 15,471,827 full-time equivalent employees, that during 2018 will produce some 65.3 billion office documents with a predicted fully burden cost just over $38.2 billion dollars. When you’re pushing dirt, moving material, and building infrastructure you need the right equipment. 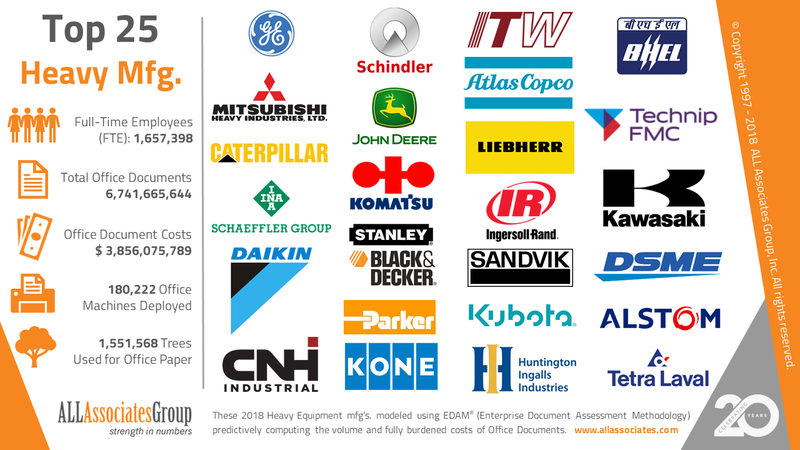 We studied 109 global heavy equipment manufacturing companies staffed by 2,850,155 full-time equivalent employees, that during 2018 will produce some 11.5 billion office documents with a predicted fully burden cost just over $6.1 billion dollars. You think student debt is high, during 2018 we studied 108 American Colleges and Universities encompassing 3,993,204 full-time students that are supported by 299,393 full-time faculty and 755,513 staff employees. 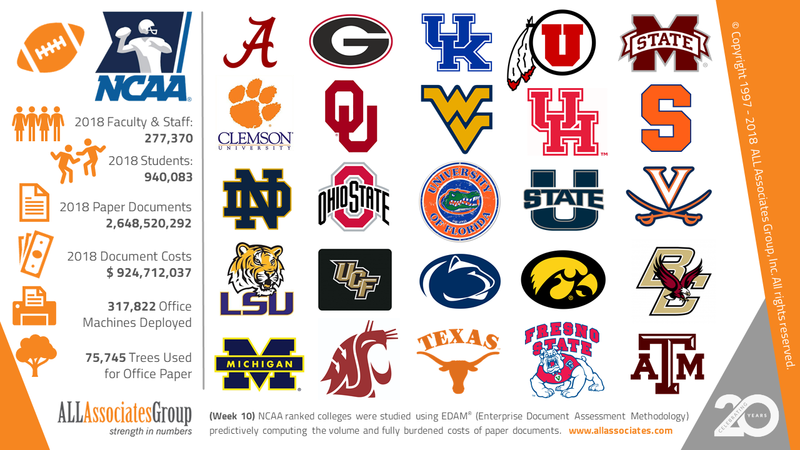 We calculate that combined, they will produce some 11.2 billion paper documents during this school year, using 321,218 office machines with a fully burden cost just over $ 3.9 billion dollars.